The Ottawa Japanese Language School caters to students, who wish to learn or improve their Japanese, of all skill levels from beginners through to advanced, and all ages from kindergarten students through to adults. The first Ottawa Japanese Language School Speech contest will be held on Saturday March 23rd at 13:30 at Kiwanis hall in Vanier community Centre. Youth and adult student's Japanese as a foreign language. The summer course for adult will be held every Saturday morning in June 8th to July 27th for 8 weeks from 9:30 to 12:00 at Ottawa Japanese Cultural Centre, B16-2285 St. Laurent Bld. Please visit http://ottawajapanesecommunity.ca/ for more details about the OJCC. The registration is on May 4th between 9:30 and 11:30 at current location,307 Montgomery St., and the fee will be $150, we accept cash and cheque. The courses are for Beginner, Intermediate and Advanced level and there are limited number of registration therefore first come, first served basis. Congratulations to Katherine Lu, Wei Yue, Tianwei Ding and Victoria Esnard! OJLS Celebrates its 40th Anniversary! We are delighted to announce that, throughout 2016, the Ottawa Japanese Language School (OJLS) will be celebrating its 40th Anniversary. As part of the activities and festivities, we greatly thank all students who submitted designs for the 40th Anniversary Logo Contest last winter. The organizing Committee has selected the below proposal by Christopher Cooper, student at Adult Beginner 1 level, to represent all activities marking this year’s celebrations. He will be receiving a one-semester scholarship for the OJLS’ fall semester. Congratulations Christopher! OJLS is very pleased to announce that the Otto's Subaru Scholarship 2017 - 2018 was awarded to Jared Whitehouse at the Year End Ceremony on May 25, 2018. Otto's Subary has also confirmed its renewal of the scholarship grant to an outstanding student for the coming year 2018 - 2019. 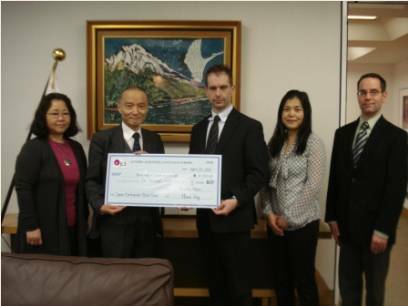 We kindly thank Otto's Subaru of Ottawa for their continued support of Japanese culture and language learning. On March 11, a magnitude 9.0 earthquake occurred in the Tohoku region of Japan. Minutes later, the coastline of the same area was struck by a massive tsunami. The damage seen on newscasts and websites is shocking and sobering for all of us. Every student and staff member at the OJLS has a connection to Japan in some way, whether it's family, hobbies, cultural interest or simply a love of the language. Japan and her people have given us many beautiful and interesting experiences, but now the Japanese people need our help. OJLS will be collecting donations for earthquake relief on Saturday March 19 and 26. The fastest and most effective way to get aid to where it's needed is for us to donate money to an existing aid organization so that materials can be purchased in large, economical quantities as near to the affected areas as possible. For this reason, OJLS will only be accepting cash donations and we will immediately forward all donations to the Japan Red Cross. The OJLS Board of Directors is also organizing a donation-matching program, details will be available on Saturday at the school. A staff member will be located in the hallway near the school office to accept your donation. If you would prefer to receive a tax receipt, you may donate on-line at: www.redcross.ca. Please be sure to select the "Japan Earthquake/Asia-Pacific Tsunami" campaign. Online donations will still be eligible for donation-matching as long as a copy of the receipt is provided to the school. Thank you for your support. Can I register after the registration day? This depends on the level. Please call the principal to find out or come to the office between 9 and 9:30 a.m. to register. See Location for the address of the school and a map of its surroundings. Usually on the second Saturday of September. See Calendar for details. I've never studied Japanese before. Which class should I start with? You can begin with the "Beginner 1" class. See Courses for more details. Do you have classes held at times other than Saturday mornings? Unfortunately, we only have classes on Saturday mornings. This depends on the level. Please call the principal to find out.